A compassionate and vital role in our community. Since 2003, the Gathering Place has played an important role in our community serving warm, nutritious meals to approximately 150 people per day. But it is much more than a “soup kitchen”, it is a non-secular, welcoming and respectful environment that is also a place for conversation, support, guidance and refuge. The Gathering Place is exceeding its capacity in terms of functionality, operational requirements and space. As a result, it has become debilitated in it’s ability to sufficiently service those in need. After much searching, a building on Cassells Street was purchased. With the appropriate renovations it will allow the Gathering Place to provide the programs our community needs and deserves. 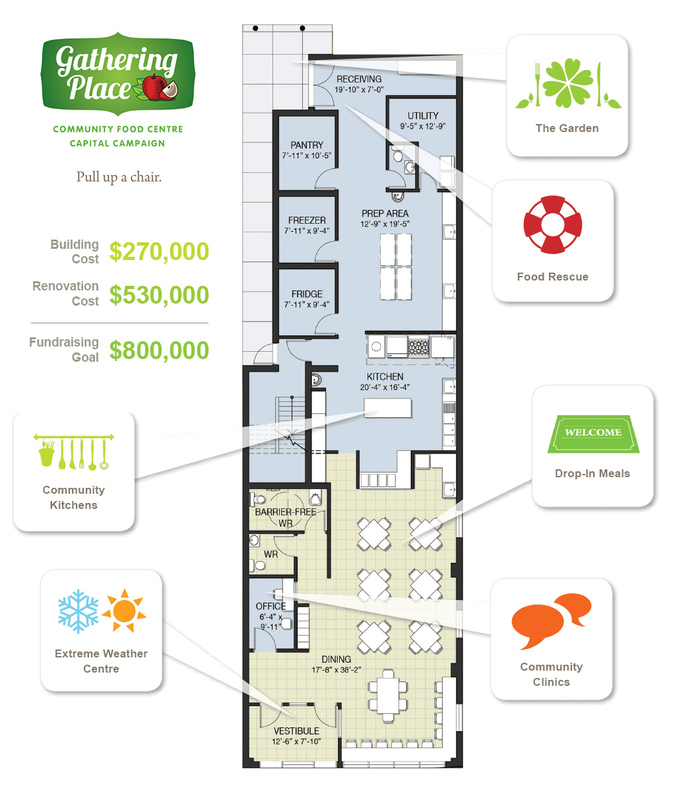 Much more than a soup kitchen, the new Community Food Centre will sustain the Gathering Place’s distinctive niche within our community as a centralized resource for support and healthy living. It is a project that will generate far reaching benefits to you, the community and its stakeholders. The Gathering Place is seeking the community’s continued support of a much required service that is only growing in need. You can make a donation to the Capital Campaign online or by contacting Jill Clark or Jim Liddell below.